Product #46679 | SKU 18860/A | 0.0 (no ratings yet) Thanks for your rating! The silver K&M 18860 Spider Pro Keyboard Stand is an adjustable double-tier keyboard stand that measures 4.29-feet (1310mm) in height for seated or standing positioning and easy set up. The 18860 Spider-Pro is equipped with dual-tier support arms and a 3/8" or 5/8" microphone stud for booms, goosenecks, etc. 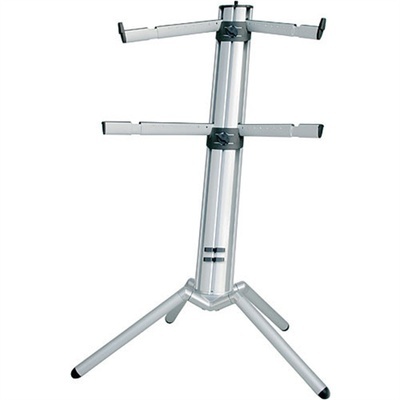 The tiers are height adjustable and can be secured at any position on the vertical stand. The tiers and legs fold into the support tube for easy transport and storage. The support arms are capable of a 15-degree tilt for adjusting depth between 11.81 to 18.70" (300 to 475mm). The 18860 Spider-Pro is capable of supporting up to 77 lb (35 kg) per tier and is an ideal solution for touring musicians, home studios, etc.